The ever growing popularity of the “Third Kit” throughout Britain during the early to mid 1990s finally reached Tannadice in 1995, when Pony brought out this stylish black and grey design for United’s first ever Third kit. Third kits had been around for years, but were only used in exceptional circumstances, and well before the days of kit and shirt sponsorship deals. United had dabbled in the past, mainly in the 1960s and 1970s, using an alternative kit with a slightly different design to either the usual Home or Away kits. But by the early 1990s, more and more clubs were using them, to the point that the clubs began to sell replica versions of them to their fans. 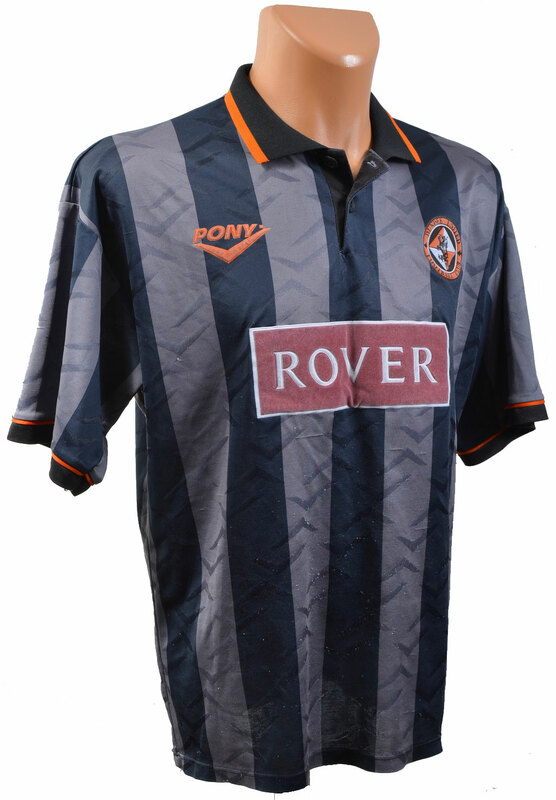 Maintaining the same design as the Home and Away kits, the United shirt had vertical black and grey stripes, a black polo style collar with tangerine trim, and the Rover sponsorship logo on the front. The black short were similar, if not the same shorts as the Home kit, and the team played in black socks for the first time since the late 1950s. The new Third kit was worn at least twice, in two big victories over Dumbarton at Tannadice, winning 8-0 in December to avenge the 1-0 defeat at Boghead, and also in the 6-1 win in April. The kit was continued into the 1996/97 season as United returned to the Premier Division, with the Rover motif being replaced with the new shirt sponsors logo as Telewest Communications took over. However, it is not known if the shirt was ever worn by the team after their year in the First Division.